Strap in for his Piano Concerto No. 2. The other week, I bought a bonus set of tickets to see the symphony live, specifically so I could see Tchaikovsky’s Fifth Symphony. I won’t be relitigating that piece of music; please assume it is still tremendous, because it is. To commute from my apartment to the symphony center in Chicago is a straight path south a few miles, and I can usually do it via bus. It takes about half an hour. What I had neglected to remember, however, because this was earlier in the month, was that a very specific and obnoxious event was happening right in the middle of my commute to the symphony, and that … was ZOO LIGHTS. What is Zoo Lights, you might be asking, as a non-Chicago native? Great question. It’s when Lincoln Park Zoo, a free zoo, in the middle of the city, in the middle of my route to the symphony, puts up all of their holiday lights. And you have to believe that every single family of five decided to go to Zoo Lights and cross the path in front of my bus on my route to the symphony. And you have to believe that a route that usually takes me about half an hour took an hour and fifteen minutes. I am a person who is never late for anything in their life, and I was late to the symphony. I nearly had a meltdown—even though the Tchaikovsky wouldn’t be until the second act—and sprinted the last four blocks just so I could get off the bus. I wound up missing a Wagner overture (lol—I’ll get back to it one day), and I sat down, huffing and puffing, coat still on, just in time for Rachmaninoff’s Piano Concerto No. 2. I haven’t written about Rachmaninoff for this column yet, so I believe a bit of backstory will help. 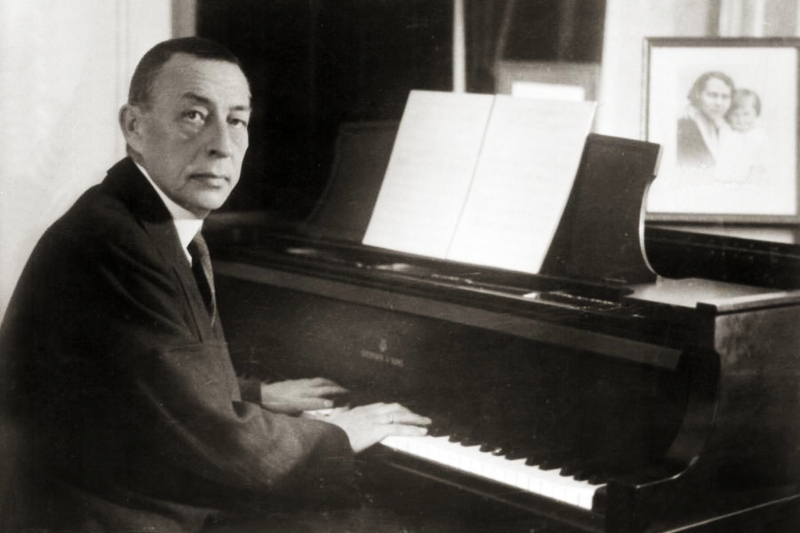 Sergei Rachmaninoff was a Russian Romantic composer, born in 1873 and dying in 1943. This puts him right after Tchaikovsky and Rimsky-Korsakov, but right before Prokofiev. His music is lofty, emotional, and yes, romantic (lowercase r). He broke big onto the classical music scene with his First Symphony, but quickly fell into a deep depression and began drinking heavily, the pressures to live up to high standards bearing down on him. It was following an arduous path to recovery that Rachmaninoff composed his second piano concerto. I really had no idea what to expect, and you know, I’ve been floored by a piano concerto before, but this one truly stunned me, neurons firing on all different levels, simultaneously settling my nerves of having arrived late but also getting me all worked up all over again. It was a full ride, and I haven’t stopped listening to it since. Piano Concerto No. 2 (Bernstein, always) begins with the soloist playing a heavy and serious melody closely followed by the strings. It’s no doubt immediately intriguing but it does take some time to establish itself, which is part of what I love about it. Rachmaninoff teaches you how to understand the story of the concerto. Conflict does, however, emerge between the piano and the orchestra, an intense back and forth around the 4:30 mark. Can I tell you at what point I truly fell for this piano concerto? It’s coming up. For the first thirty seconds at the 6-minute mark, there’s a huge build. Was the piece about to end? Is this the climax? But then, right at the 6:33 mark, it all falls into this forceful melody, powerful and joyful, led by the piano. It blindsided me so completely, I was hooked. The Adagio sostenuto (slowly, sustained) begins more as a thoughtful dialogue between the woodwinds—the flute, the clarinet—and the soloist. It’s almost played at a walking speed, an ambling speed. It’s slow, but it’s not too leisurely, and it’s not saccharine either. There is a tension beneath it all. Again, only ever having been a “fairly okay” pianist, I have to say this part feels hard. Every emotion in the world is squished into this concerto. When the melody around the 5:00 mark begins, it almost feels as if the piano has broken out from the orchestra to reclaim the narrative of its own right. It sets the tone, the pace. Of course, that’s how a concerto works, but you know what I mean. Emotionally. It pushes through, and it pulls the orchestra along with it. I felt immense whiplash around the 7:37 mark as the piano trickles back and forth beneath the languid strings. Rather than the strings buzzing beneath the soloist, roles are reversed, like the world’s been turned upside down. That’s what’s so incredible about this concerto: it’s impossible to grasp onto for an extended period. The final movement, the Allegro scherzando, is a furiously interesting piece of music. If you thought the concerto was difficult to keep ahold of before, this is where it really goes off the rails in the most wonderful way. It’s hard for me not to think of Rachmaninoff shedding his depression and his addictions, even if only temporarily, in order to cobble together this concerto. It has all the dizzying nature of recovery and rebirth—a scattered energy that works so achingly to prove itself cohesive. That’s not to say the concerto isn’t cohesive; the more I listen to it the more it becomes a whole instead of favorite parts. But still. In the final few moments of it, I felt such a glorious rush. My face got hot, I was sweating, I realized I never took off my coat.